Toy Tank - Lt.vz 38 - Light tank of axis forces in WWII. This character for Poser based on the Czech light tank, an early Lt.vz 38. This is 3 variations of country: Czech, German and Russian (captured tanks widely used in war). Color variations changing in the Poses Categories-Papus3d-Lt38. forward, or move manually and rotate both tracks, or left or right tracks separately. In Props you find a box and RC-pult for your toy scene. The Tank need in positioning into box. If you parented Box into Tank, you may moving tank with Box in your scene. tryphon (7 years ago) Inappropriate? I love it, this is a wonderful model, & yes it does fill a gap in the early war period Polish, French & early Russian campaigns. Koodos & thank you very much. Papus3d (7 years ago) Inappropriate? Thank you. 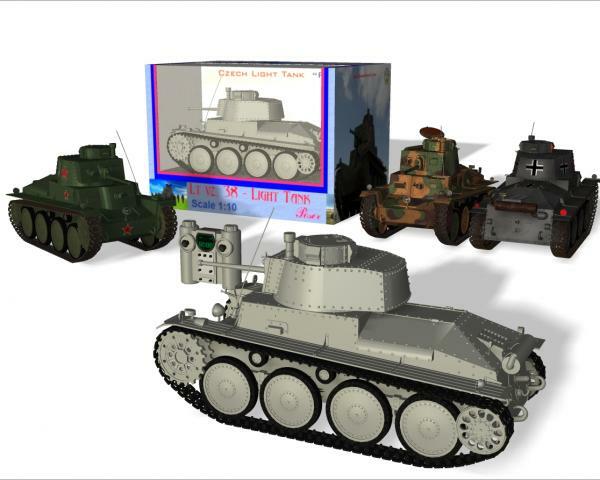 I'm working on Pz38(t) latest version, and on Hetzer and will modeling Landsverk l60 and Skoda T-21. There served in Hungarian Royal Army in WWII. And from guns the SIG MKMS (hungarian variant) modelled, and trying to make to Poser. May I suggest/request a Renault FT7 and/or SOMUA to continue? 1000 thanx! You're closing a history gap with this great model. Man, you just can't do anything small! I revisited your collection and reconfirmed what I just said. I admire your skill and attitude. Many thanks and keep on. Rendersapien (7 years ago) Inappropriate? Outstanding model with great functionality and textures. Thank you. Don't let the toy label fool you. This model is no toy. It is a super realistic and functional model with many sophisticated features and four accurate color schemes. Fun for modelers of all ages! Thank you for you sharing it with all of us!